I put the finishing touches on the garments for the Fall issue of Cast On. I hadn't woven in the edges on the hats, scarf and socks. They are all done now and ready to go. The photo shoot is Tuesday. I have a few things to get ready for the Mackinac meeting which I will do on Sunday. By the way, I will not be making a blog entry until June (most likely). After the meeting in Mackinac I am going to Washington state for a week. If I have time to do one before I go, I will. If any lessons arrive while I am gone, my neighbors will take in the packages. I'll be able to process new orders while I am gone. Last week I discussed seaming horizontal edges (bound off stitches). Where you will use this technique more often is for shoulder seams. There are a variety of ways to shape shoulders. The easiest way is to simply bind off the shoulders. This produces a straight edge. Some pattern call for shoulder shaping. If you use short rows to shape the shoulders, the edge is easy to seam. Another way to shape shoulders is to bind off stitches incrementally. 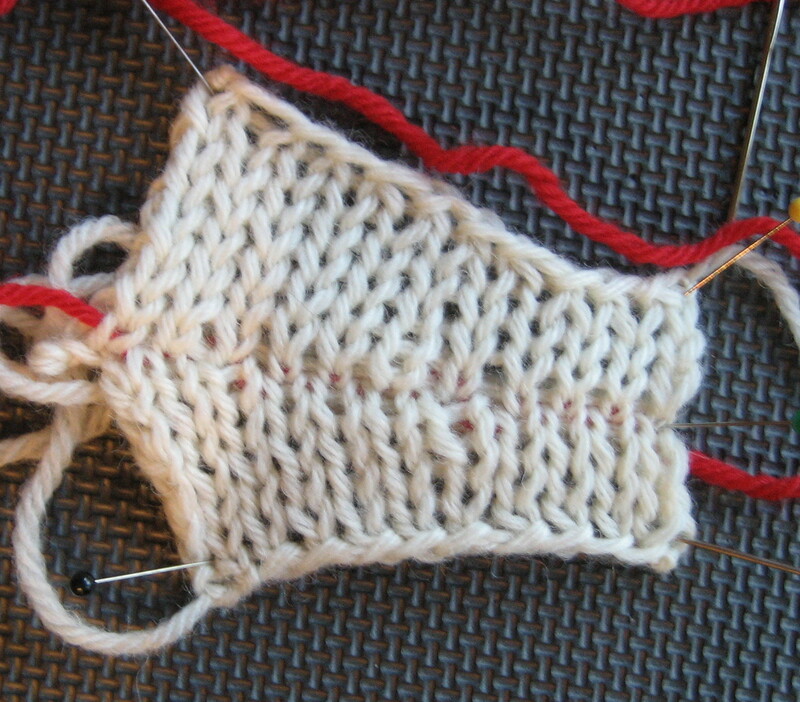 Seaming this type of edge can be tricky as the bind off process leaves "stair steps." A common mistake is to place a seaming stitch IN the stair step. If you insert a needle into a hole, it just makes the hole larger and this is true of seaming. When you insert the needle into the stair step, you disrupt the stitch pattern and leave a hole. When you seam a horizontal edge, the rule is to seam in the stitch BELOW the bind off edge and this is true for stair step edges as well. It looks like it will not work, but trust me, it does. This photograph shows where to place the seam. Notice the stair steps are skipped. This photograph shows the seam in progress. Notice how the seaming thread seems to jump over two rows at the stair steps. 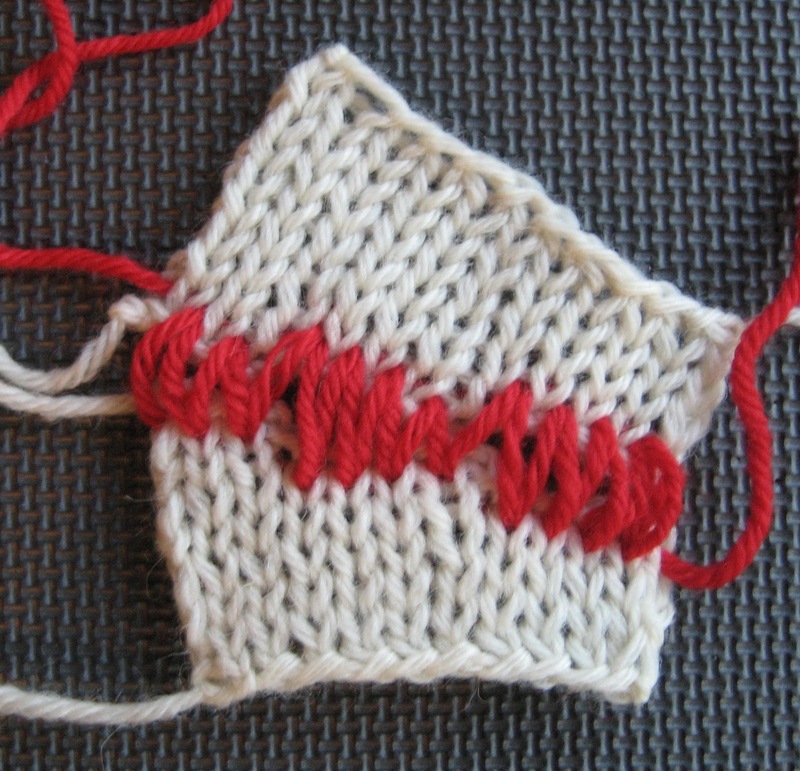 This photograph shows the seaming thread pulled tight. 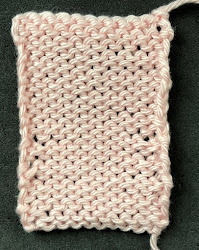 Keep in mind, I used size 11 needles to knit these swatches so that you could clearly see the stitches. This swatch isn't very attractive due to the tension, etc. On a real swatch it looks much better. I have stretched and pulled it so that the seam is clearly seen. Salon will be on Saturday as I need Sunday to work on my workshop. I looked at a calendar this week and realized I am running out of time! I like to bring extra rulers, etc. in case the students forget. I have to look at a calendar to see when the next Salon will be...not next week as I will be leaving Saturday for Mackinac. The Blue Pansies socks are done and blocked. I am very pleased with how they turned out. Now that I am finished with the things for Cast On, I can catch up with birthday presents. I've finished the socks for Cara. She loves pink. I found this stitch pattern in one of my Japanese stitch dictionaries. I think it looks like gum drops. That might be due to the color. 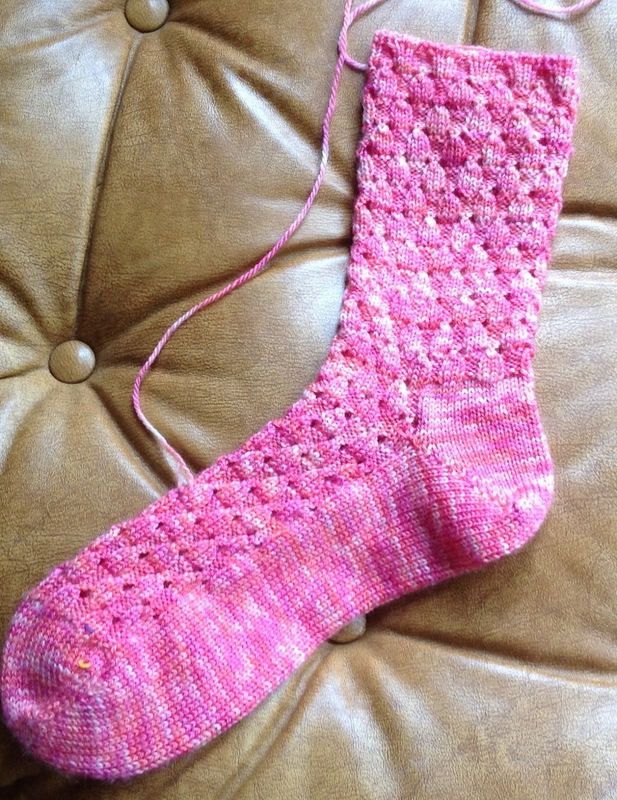 The other sock is blocking. 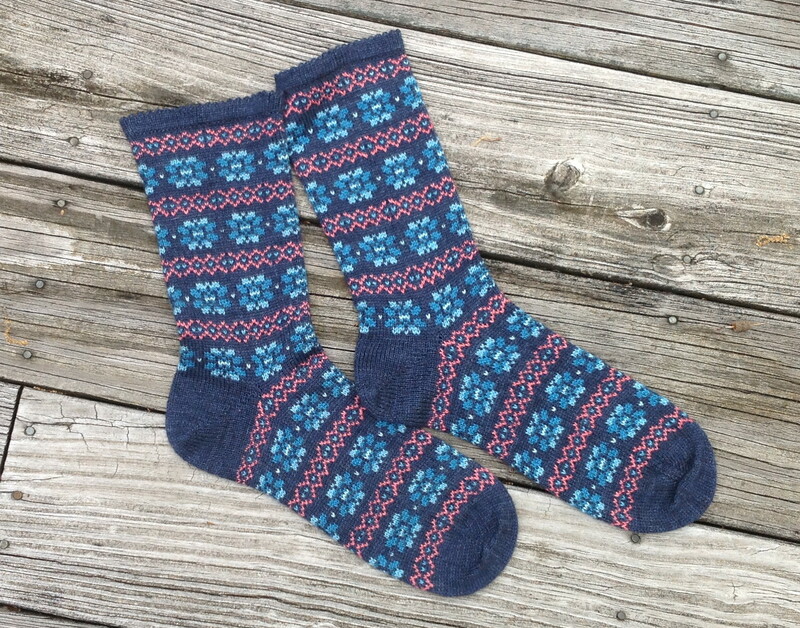 I am going to use this same pattern for another pair of socks. The yarn is a solid color so the pattern should be easier to see. 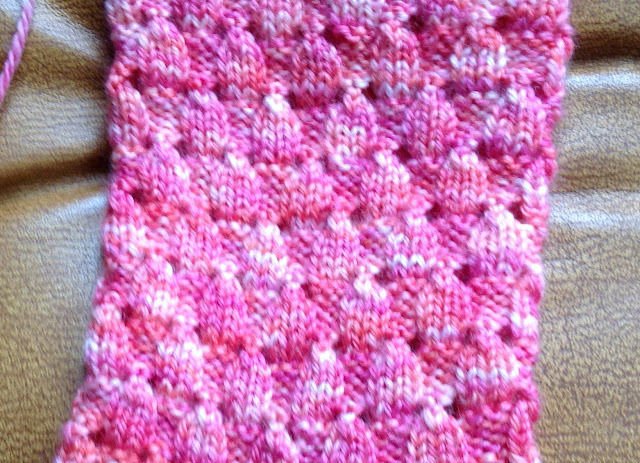 Here is a closeup of the stitch pattern. It is mindlessly easy (nice break after the Pansies). 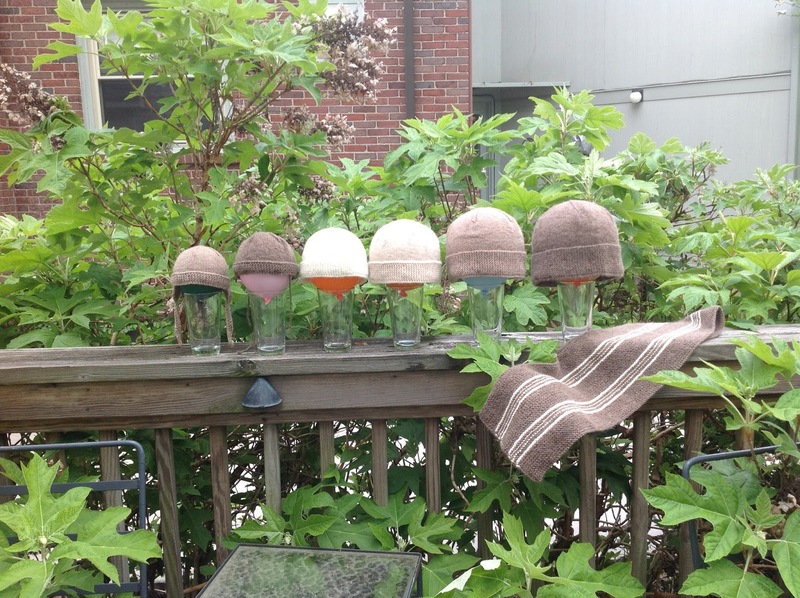 After I knit the hat I skipped, I took this photo. I think they are fun. I put the scarf in the hat as well. Thank you for the excellent explanation and videos on seaming edge to edge, especially relating to stair-step shoulder seams. In recent knitting projects I had been driving myself mad trying to do short rows as I could not seam the shoulders neatly. Now I can cast off as normal and seam neatly. Thank you! One more question – do the black diamonds on the first picture indicate where you should insert the sewing needle?